This 2 storey Ekamai house for rent has over 165 sq.m of living space with a bright airy living / dining room with sliding doors opening out onto a small yet private garden. The kitchen is western in style, separate from the livingroom with a gas stove (hob), extractor fan, brand new fridge freezer and washing machine. On the 1st floor the floors are all newly finished in ceramic tiles. The 2nd floor has hardwood flooring for the 2 double bright bedrooms and 2 bathrooms. The owner is open to pets - cats and small dogs ( to be agreed). Available for minimum 1 year rental contract. Viewing by private appointment only. 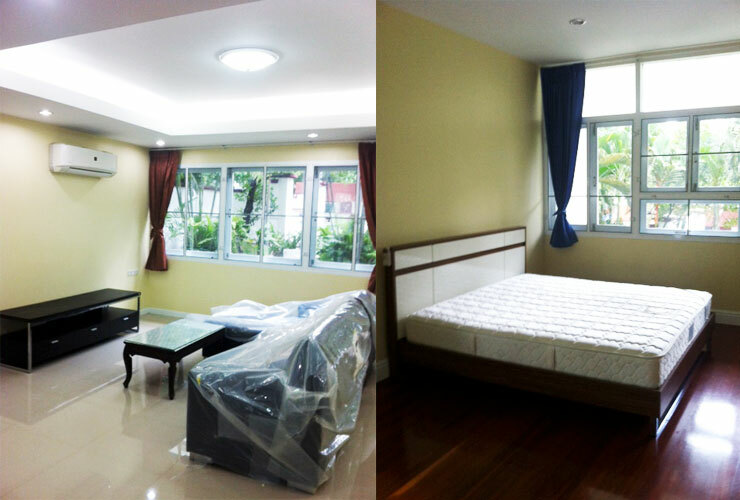 This is a detached 2 storey house of 165 sq.m fully renovated in 2014 with a small garden located within easy reach of BTS Ekkamai.